A festival in honour of the Armenian composer Avet Terteryan, who died in 1994, will be held in his homeland on 29 July 2015. 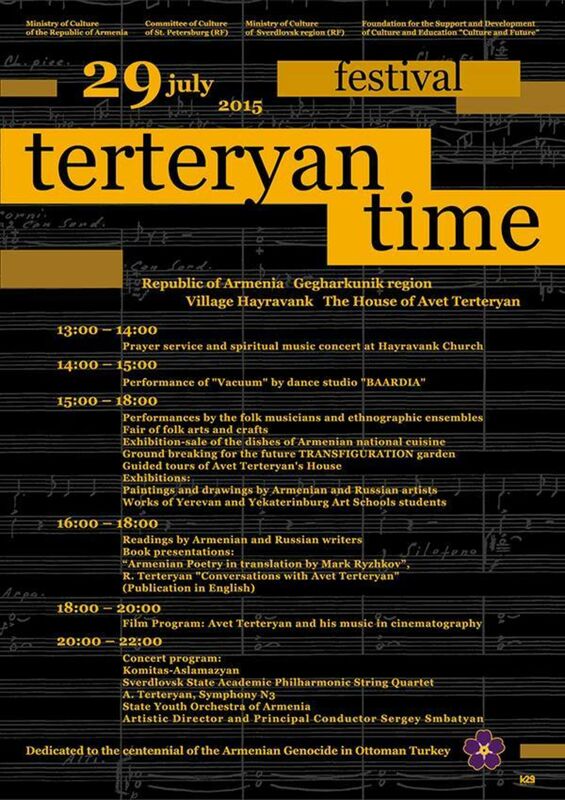 During the course of “terteryan time” in his native city of Hayravank, various readings, lectures and concerts will be organised at different places (including the composer’s house). The highlight of the festival will be the performance of the Symphony no. 3 written in 1975 with the State Youth Orchestra of Armenia conducted by its music director, Sergey Smbatyan. Avet Terteryan (baptized as Alfred Rubenovich Terteryan) was born on 29 July 1929 in Baku, Azerbaijan. His father, Ruben Terteryan, was a renowned physician in Baku. Avet’s brother Herman became an opera conductor and his son Ruben a musicologist and author of the book “Avet Terteryan,” published in Yerevan in 1989. Terteryan’s wife, Irina Tigranova-Terteryan, was professor of musicology in Yerevan. She died in 2011. In 1948 Vet Terteryan entered the Music Academy in Baku. He continued his studies at the Roman Melikjan Music Academy, which he entered in 1951. From 1952 onwards he studied composition with Eduard Mirsoyan at the state Komitas Conservatory in Yerevan. Avet Terteryan occupied a series of offices in Armenian cultural life administration. From 1960 to 1963 he was Executive Secretary of the Armenian Composers’ Union, from 1963 to 1965 its Vice President. From 1970 to 1974 Avet Terteryan functioned as Chairman of the Music Department in the Cultural Ministry of Armenia. At the same time he worked as an editor. From 1985 he was active as Professor at the Conservatory in Yerevan. In the years 1993 to 1994 he gave master classes at the Ural Conservatory in Ekaterinenburg. In order to work undisturbed on his own compositions, he withdrew at regular intervals to the guesthouse of Dilishan, replaced by his own house on Sevan Lake starting in 1989. In 1992 Avet Terteryan was named President of the Austrian-Armenian Society of Friends. In 1994 he received a stipend from the Province of Brandenburg and worked for six months in Wiepersdorf. He was promised a one-year stipend of the German Academic Exchange Service for the year 1995, but Avet Terteryan died on 11 December 1994 in Ekaterinenburg, where he wanted to participate at a festival dedicated to him. He was cremated on 19 December at the Pantheon in Yerevan.